The temple of anger, Man-mandira, is located on the top of Varshana hill over-looking beautiful Gavarvan forest, and it commemorates the site where Srimati Radharani became angry (pro. maan) with Krishna when She seemed to feel that He had been with another. Lord Krishna pleaded with Lalita-sakhi to pacify Radharani, but She refused to hear His plea. Their ultimate union resulting from this exchange is the eternal Mayura-lila or peacock dance, which takes place on the hill opposite to Man-mandira. The sadhu caretaker of Man-mandira, Sri Radha-charan das Babaji, once revealed that Radha feigned anger because Krishna, while praising Radharani, had compared Her beauty to the Moon. But the Moon is known to possess 10 faults, viz., always changing, having spots, etc., so Radharani took offence. Man-lila is unlimited, so there is no end to the reasons for Radharani's feigned anger. But according to Babaji, there is no question of Radha being angry like we know in this material world, it is all done for the ever-increasing pleasure of Her eternal Lord Krishna. In recent years, Man-mandira as well as the path to it have been greatly improved (including WC) by the local Varshana-vasi's. These Vraja-vasi's are devotees or well wishes of Radha-charan das, who is the caretaker of Man-mandira for the last half a century. Please consider that Radha-charan is a sadhu coming from outside of Vraja-mandala whom even the Varshana-vasi's support as their greatest living renounced saint. The Varshana-vasi's respect and follow Radha-charan Babaji. And yet he says that nothing can compare to Radharani's eternal associates the Varshana people (Vraja-vasis). They praise his singing and yet he says nothing can compare to them or their singing. He says that his own voice is "hard & dry" compared to the sweetness of the Varshana people's singing. There is a very real and sacred relationship between the Varshana-vasi's and Sri Radha-charan das, who is considered by the Varshana-vasi's themselves to be the best devotee amongst them all. For over 50 years Radha-charan has dressed almost only in an old white kaupina and a blanket for winter. He is the personification of Vairagya. He always keeps a shaved head (the Varshana kids used to shave him). Although he is a very learned scholar who can speak perfect Sanskrit, English & Vraja-bhasa, still he practically (except on any Vraja-mandala darshan arranged by him and the Vraja-vasis them selves) never leaves Man-mandira, not even into Varshana. In the evening he holds rip-roaring Vraja-bhasa sankirtan with the local kids and now even their parents. I don't know very much about his background because it seems so out of place to ask about, with him in an obvious state of total surrender to the eternal service of Srimati Radharani at Man-mandira. Here is what little I know of his life. His primary scripture is Srimad Bhagavatam. The eternal service of Radha Krishna is his very life and soul. And fantastic kirtana is his favorite means of serving the Divine Couple. But the key is his intense renunciation of material comforts and amazing staying power. He appeared in central India about 70 years ago as a very well bred Brahmin boy named Ramesh, and he was an exceptional student. He excelled in Sanskrit, Hindi, and English (he speaks all perfectly); but his major in College was classical and devotional music, which he loved most of all. During his student period (due to unknown sukriti) he became initiated by an empowered Vaishnava saint who advised him against getting caught within the material entanglement during this life. His Guru's teachings made a great impact on him, and the tree of jnana, bhakti & vairagya grew strong within his heart and intellect. Soon his parents were arranging for his marriage, which they wanted him to accept. His dilemma was two-fold, 1) he couldn't refuse his parents wish that he marry, and 2) from his Gurudeva he knew that he was unable to live a material life; and to marry this girl and then leave her for his spiritual urge would ruin her life and be unfair to her. So to solve this dilemma he did the traditional Vedic thing, i.e., he renounced the world and became an avadhuta-sadhu; and from a young age for the past 50 years he has resided as the eternal servant of Sriji at Man-mandira in Varshana. His dispassion, steadfastness and austerity are incomparable to any other persons I have ever known thus far. When he first left home he went to wander dressed only in kaupina deep in the wild Chitrakut forests. He used dried weeds and grass to create a blanket during winter and lived as an avadhuta, under going incredible hardship to gain the grace of Srimati Radharani and Her Lord. He would eat what he could find on trees including leaves. And he endured many mortal dangers while deep in the dark Chitrakut forest and every time Lord Krishna would save his life like a miracle. But he began to feel that by residing in this dangerous condition he was causing some inconvenience to Lord Hari Who had to save him repeatedly. So feeling this way he decided to leave Chitrakut. With his heart set on the feet of Sriji he walked bare foot (he had 0 possessions except a kaupina) and ended his journey at Man-mandira in Varshana. The temple was rubble with a broken circular rasa-mandala in the center of a pebble strewn old courtyard. The place was deserted except for the cobras and many scorpions. During his life at Man-mandira Radha-charan das has been stung by scorpions many times. After his long walk and with almost no nutrition he collapsed onto the rasa mandala and became delirious with a malaria type of fever. He lost time of material life and just took shelter (mentally) of Sriji, ready to leave his temporary mortal coil. Then, at some point unknown to him, he was awakened by a kind young Varshana boy who asked about his health. The Babaji was too weak to reply, but the boy poured some water into his mouth and said he would get better. Almost immediately he recovered his health and went asking in the village below about the identity of this boy. None of the Vraja-vasis knew of any such boy other than Lord Krishna Himself. So taking this as a blessing he resolved to remain for life at the Feet of Radha & Krishna at Man-mandira in Varshana-Dhama. His early years there were amazingly austere, with Radha-charan again making a crude blanket with dried weeds during winter. By Radharani's arrangement he was given madhu-kari by the local Vraja-vasi's through their kids. And he would share his stale bread with any other sadhu who would come (I saw this many times). Even when I first knew him around 1969 his life could still be classified as cave-man austerity with an avadhuta personality. Pure Radha-sakhi-bhakti-rasa, with NO material desire, not even for any recognition. When I saw him again in 1994 he had lightened-up a bit at the insistence of the Varshana people. I could see that now he slept on a peace of wood and even used a real blanket. He told me with a sigh that he had fallen a victim to luxury. What could I say? Please consider the paradox: In Varshana there are always many locals very aggressively hounding visiting devotees, often to the point that the devotees get angry and commit dhama-aparadha. But Radha-charan, who is an outsider, is fed, clothed and supported by these same 'seemingly' pesky beggars because he is the REAL sadhu, who has no possessions other than the love of the Varshana vasis. This is something almost unthinkable to Western oriented Vaishnavas who are weaned entirely on the material concept, even in their spiritual approach. Some "sahib" style devotees even think that material results, like so-called laxmi-points, or any other material consideration are proof of bhakti, when in truth bhakti has nothing to do with any intended or expected material result. It is an offense to judge another devotee's level of loving Lord Krishna, especially based on material results. Material results are what the gross materialists base everything on. So to say that because such-n-such devotee did more materially therefore he is better than another devotee (based on material results) is a completely mundane concept. During the years I often resided at Man-mandira the temple, which is located on a hill above Gavarvana, was very rundown. A crumbling stone wall around a small courtyard, which contained the large rasa-mandala in front of the small shrine room. During my early stays they had a very small and rotted picture of "Man-lila" as the Deity; but later I discovered a much larger, very charming picture of Man-lila, which I had framed and carried to Man-mandira. Immediately Sri Radha-charanji established this new "Chitra-vigraha" as the new temple Deities. I felt that Srimati Radharani had so kindly accepted my little personal service to Vraja-dham. And that same Chitra-vigraha is still presiding there even today. On both sides of the small shrine are stone/mud rooms. One room leads to an ancient stairway, which descends into the snake-infested bhajan cave-room. This room has many stories to tell, but its main attraction is a flat stone slab where Radha & Krishna sat during the Man-lila exchange. To the pure devotees this stone (which is crammed into a crack in the cave wall) glows blue on one side and golden on the other. When going down into this cave room the Vraja-vasi kids (who always stay close to Radha-charanji) will go first with lamp and bang sticks on the stairs to scare away any deadly poisonous snakes. It's very nerve-wracking to perform bhajan in this dark cave because of the snakes and scorpions. I can still remember some of the wonderful stories that Radha-charan Babaji narrated to me over the last 30 years, and I will repeat some of them here because they were spoken by Radha-charan das Babaji himself. Many saints have performed their bhajan at man-mandira in the before mentioned cave room, and among them was a king from Rajasthan, the Vraja-vasi story goes, who had been very miserly and sinful in his lifetime. When the king reached old age he heard that his son planned to kill him and take over the kingdom. Despondent upon hearing this news, the king realized how much his life had been wasted in sinful pursuits and how he should therefore surrender to Radha and Krishna. Renouncing everything and sneaking away from his palace, the king traveled alone and eventually came to this temple of Man-mandira, where he surrendered to Their Lordships. Thereafter he was heard to be chanting the holy names of the Lord constantly. After many years of practice in this sadhana, the king had become highly enlightened. One day he dropped his japa-mala and picked up a poisonous snake by mistake. The snake bit him on the finger, and seeing his life ebbing, the king emerged from the cave and went to the rasa-mandala, or the circular platform in the center of the courtyard built for Radha and Krishna. Standing on this platform he prayed to Srimati Radharani, "O Radhe, please take me! Please take me! Please take me!" With his arms outstretched, he saw that the virulent poison from the snakebite was leaving his body in drops from his finger. Astonished, but aware that this was Radharani's special mercy upon him, he entered his cave in great ecstasy and continued anew with his worship. Although the poison had vanished, however, the wound itself had become infected, and in time it turned into a wormy, gangrenous sore inside and out. This made it practically impossible for him to chant the holy names of the Lord with his japa. beads and thus he counted his rounds in his mind. While still in this condition, a beautiful young gopi girl whose effulgence lit up the whole cave approached him and asked what was wrong with his arm. He told her what had happened, and thus she advised him to visit the village doctors. He was convinced, however, that Srimati Radharani was the only person who could save him, for if She could make the poison leave his body then She could also cure this infection very easily. The little girl nodded agreement at this nice display of faith in Radharani, and when the girl left he could understand that She was Srimati Radharani Herself. Inspecting his arm he saw that it was miraculously cured, but in feeling distraught that he had not immediately recognized Radharani when She personally came before him, he simple left his body then and there and returned home, back to eternal Varshana in divya Goloka-dham. From the gateway at Man-mandira are stone stairs descending through and into the sacred forest of Gavarvan with Krishna Kunda in the very center. "O Radhe! This wonderful garden of Gavarvan was built personally by You with Your own beautiful hands, and You are always walking amidst this garden thinking of Krishna. The footprints and dust of Your lotus feet are everywhere, and we only pray that we may be able to sweep this Gavarvan, not with ordinary brooms but with our eyelashes, that we may see all the more closely the dust of Your lotus feet." Srila Kaviraj Goswami has beautifully described Radharani, perhaps at Gavarvan, in the following verse (nitya-lila period 3) from "Sri Radha-Krsnayoh asta-kaliya-lila smarana-mangala stotram:"
"I remember Sri Krsna in the forenoon. He was going toward the forest, followed by cows and cowherd friends. Others like Nanda Maharaja also followed Him. Because He was anxious to be with Radharani, Krsna went to search Her out on the banks of Sri Radha-kunda. I also remember Sri Radha, who, having caught a glimpse of Krsna, went home, where She was ordered by Her mother-in-law (Jatila) to worship the Sun god. Radharani had sent Her girlfriends to discover Krsna's whereabouts, and thus She was casting her eyes down the pathway by which they were likely to return." On one visit to Gavarvan around 1971 I was warned by the Vraja-vasi kids (and Radha-charan dasji) about a big "killer monkey" who had gone berserk and was viciously attacking people every day. One of the sadhus at Man-mandira named Sakhi charan das Babaji had been attacked and it looked more like the bite of a lion than a monkey. Some Vraja-vasis came to ask Radha-charan's permission to poison this dangerous beast, but he could not give his blessings. My close call with this Vraja monkey was also around the same time. I had finished my bath and gayatri at Krishna Kunda and was ready to walk back up the stairs to Man-mandira. The Vraja-vasi kids (who seemed to really love this fallen soul) gave me a long spear (a stick with one end sharpened) to carry with me for protection. When I was about half way up I heard all the monkeys screaming and shaking the trees, and when I stopped to look around I saw the killer monkey bounding towards me at full speed. I just had time to raise my spear, which stopped the monkey in his tracks about 10 feet from me. He was twice as big as any monkey I ever seen anywhere in Vraja and he glared at me very menacingly. It had become a stand off, so slowly I started walking backwards up the stairs, and the monkey, with bared fangs, stayed right on me. Suddenly I heard all the Vraja-vasi boys shouting in Vraja-bhasa, "we are coming, we are coming" as they started running up the stairs. The killer monkey looked at the boys and glared back at me, then he took off like a bolt of lightning. So I continued on up the stairs (shaking like a leaf). On my next visit to Gavarvan I heard that the Vraja-vasis had gone ahead and finally poisoned the killer monkey of Varshana. I must say it was a great relief not to worry about being viciously attacked. Opposite Man-mandira on the other hillside of Gavarvan stands Mayur-kutir, a small temple housing a famous painting of Radha & Krishna's peacock dance, or Mayur-nitya-lila. 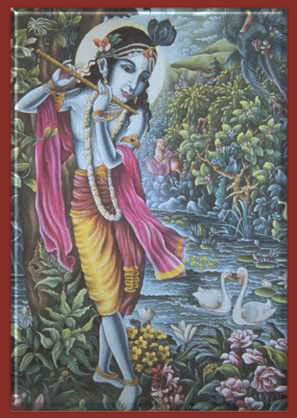 After the pastime of being angry with Krishna, described above, Radharani retired to this place with Her friends, meditating on how to obtain Krishna's forgiveness and to dance with Him like a peacock and a peahen. Happy to satisfy Her desires, Krishna flew to Her (or She flew to Him) in the form of a beautiful transcendental peacock, and it was at this site that They performed Their enchanting Mayur-lila. This temple houses a painting done by a self-realized saint who was specifically empowered to do so. He had been meditating very intensely on this peacock pastime, and one day in old age Radharani gave him a glimpse of this sacred lila. He was overwhelmed with ecstasy, but the divine vision was suddenly taken away and he was plunged into despair. He prayed fervently, and one night Radharani appeared to him in a dream and told him, "I have shown you this wonderful pastime, but I shall not display it to you again unless you paint it." The sadhu said that he knew nothing about the art of painting, but Radharani assured him that She would give him all the artistic ability that he needed. So in the morning he prepared some paints from various minerals and oils and herbs, and fashioned a brush from a squirrel's tail. Seeing that he was faithful to Her request, Radharani displayed once more the transcendental pastime of the peacock dance, Mayura-lila. Once more elevated to divine ecstasy, the sadhu began to paint this wonderful pastime. This eyewitness account of a loving pastime enjoyed by Radha and Krishna can be seen to this day. Descending to Krishna kunda in Gavarvan, and walking counter-clock-wise around Varshana hill, one will reach the narrow path passing through Sankarikar-gali, a narrow valley, and one side of which is composed of dark stone and the other side of golden stone. This valley is so narrow that people must pass single-file. This is the very spot where Radharani and Her Sakhis pass on their way to Varshana for the purpose of selling their milk products in the marketplace. As they file through this valley they meet Sri Krishna, who tells them that this valley and whole area of Vraja belongs to Him and that they must pay an appropriate toll if they wish to continue their errand. Srimati Radharani refuses to pay the toll and Lalita argues Radharani's case before Krishna, while Madhumangala argues on Krishna's behalf. Lalita argues that Varshana is in Radharani's jurisdiction, but Madhumangala says that Krishna owns everything. The result is that Krishna often breaks the pots of yogurt and both He and the cowherd boys steal the butter. Close by is a stone where Krishna placed His conch shell and wiped off the butter that had become smeared all over His hands. A complete bath in Sri Krishna Kunda is highly recommended but VERY difficult and dangerous for Western (sahib) oriented devotees. On a two-week stay at Man-mandira around 1970 I requested Radha charan Babaji to please translate the Narasimha lila from His Sanskrit copy of Srimad Bhagavat, 7th Canto. So every day we would sit together on the old rasa mandala and I would hear while Babaji read all the Sanskrit verses and explained them to me in perfect English. That was the best translation I have ever heard; emanating from the mouth of a steadfast avadhuta devotee like Radha-charan das. I hope any soul has gained an appreciation of a great living unsung saint, Radha-Krishna devotee and avadhuta sadhu, Sri Radha-charan das Babaji, caretaker of Man-mandira, in Varshana, Vraja-mandala, India, for over the last half-century.